I love pinterest. There are so many great ideas on there! Even before pinterest though, I'd seen homemade poptart recipes and thought about trying to make them with more whole wheat flour. Then this recipe popped up on pinterest. As with most of my pins, it aged a bit on my pinboard, but I did get to it! Part of my desire here is to cut back on the sugar that my kids eat the other is to avoid so much processed food and dyes. 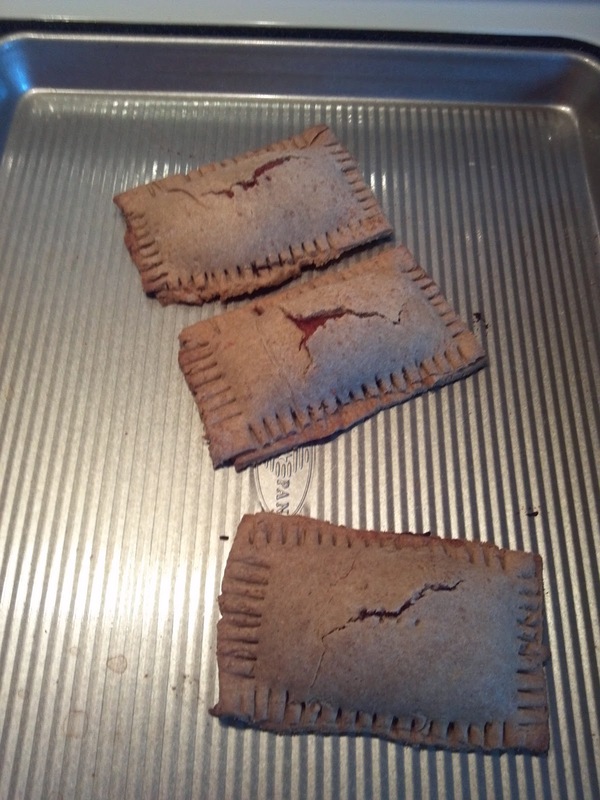 But, I wanted to test out how open they were to me making pop tarts instead of the store bought ones. Baby steps, right? So, I started with the dough in the recipe above and made it exactly how it says in the recipe. I split it in half and used half for something else (which didn't work so well), but I think you could get at least 6 pop tarts out of the dough. The first in my baby steps was to replace the filling, I just couldn't bring myself to use jelly for the filling, so I made some unsweetened strawberry applesauce by cooking a chopped apple and a handful of strawberries until they were soft then, I ran them through the food processor (I'm really missing my immersion blender, it would've made that easier!). Then, I used that for the filling. I didn't add any sugar. 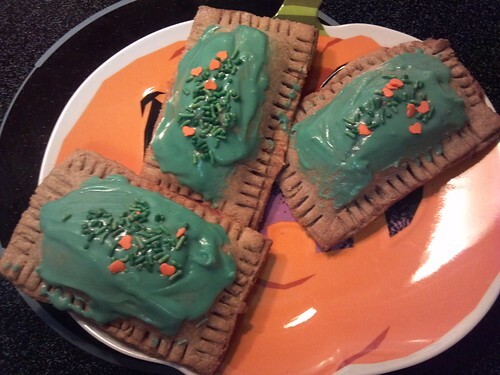 I forgot to taste it until I had already filled a few of the pop tarts. It really could've used some sugar, it was pretty tart! 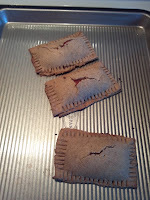 After I filled the pop tarts with the applesauce, I put the top on, crimped them around the edges with a fork and poked the top with the fork too. In retrospect, just one fork poke wasn't enough because the tops cracked. However that's ok because as I said, I'm taking baby steps here, I'm pretty sure that if I were to give these to the kids they'd reject them flat out since there's no frosting. In fact, I bought unfrosted pop tarts once and they rejected those. So I had a little bit of frosting left over from some cookies I made a while back that I put on the top and then added sprinkles (because everything is better with sprinkles!). I layered the frosting on a bit thicker than I really wanted to, in part because the frosting was too thick and in part because of those cracks. The result? The girls each ate a whole one and said that they liked them. Which for my youngest is an improvement over a lot of the store bought ones. My oldest asked that next time I use just strawberries for the filling. 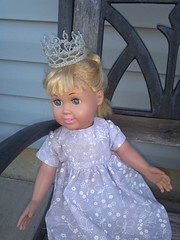 I suspect she's reacting to the tartness of it and her thoughts about not liking applesauce. Next time I might increase the strawberries, but I don't think I'll eliminate the apples completely. I would never put them in the toaster (actually mine puffed up so much they wouldn't fit anyway), but they could be heated in the microwave if you want. I had one at room temp and thought it was pretty good. Not really a pop tart but still really yummy. I made these as part of Iron Craft Challenge 20 (Edible Crafts) at Just Crafty Enough. It's that time of year! Pumpkins and squash are on sale and available at most farmers markets. 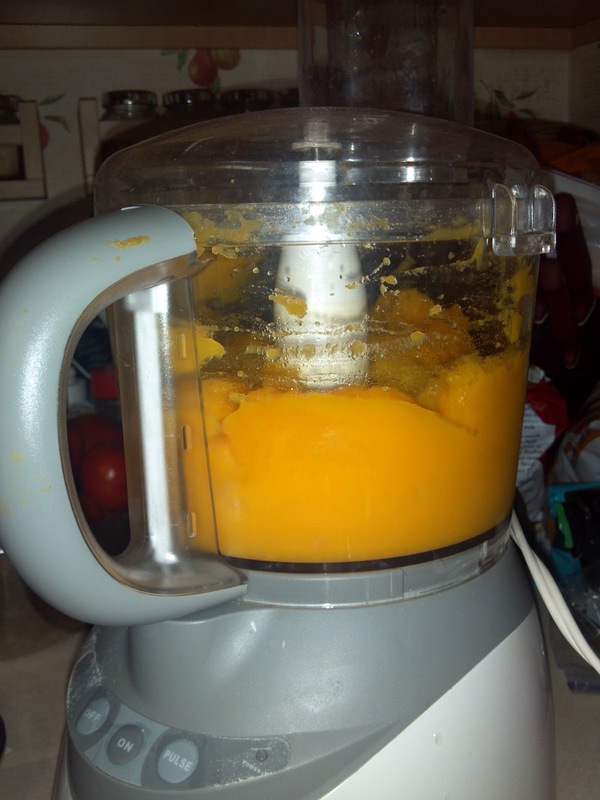 I use pumpkin in baked goods, pancakes and waffles for my kids to give them an extra bit of vitamins. I ran into problems because rarely did the recipe need a whole can of pumpkin and I was wasting the rest. So I started freezing the left overs. Then, my kids started going on field trips to the pumpkin patch where they got these little pie pumpkins that weren't big enough to carve. So, I started cooking them and freezing them to use instead of the store bought canned pumpkin. Now, I do it with squash too. Preheat your oven to 350 F. Cut your pumpkin or squash open and take the seeds out (I usually cut mine in half from stem to bottom). Place the pumpkin in the cake pan cut side up and put some water in the bottom of the pan. Bake it until it's soft. I didn't time mine, but I think it was about an hour. It'll vary depending on the size of your pumpkin or squash. Let it cool. Peel off the skin, it should be soft enough that you don't really need a knife to do this. Then cut it into chunks and put it in the food processor. Puree until it's smooth. After it's pureed, using your 1/4 cup measure, scoop 1/4 cup into each of the cups in your muffin pan. Freeze it (I do it over night). Once it's frozen solid, pop them out and put them in freezer bags. 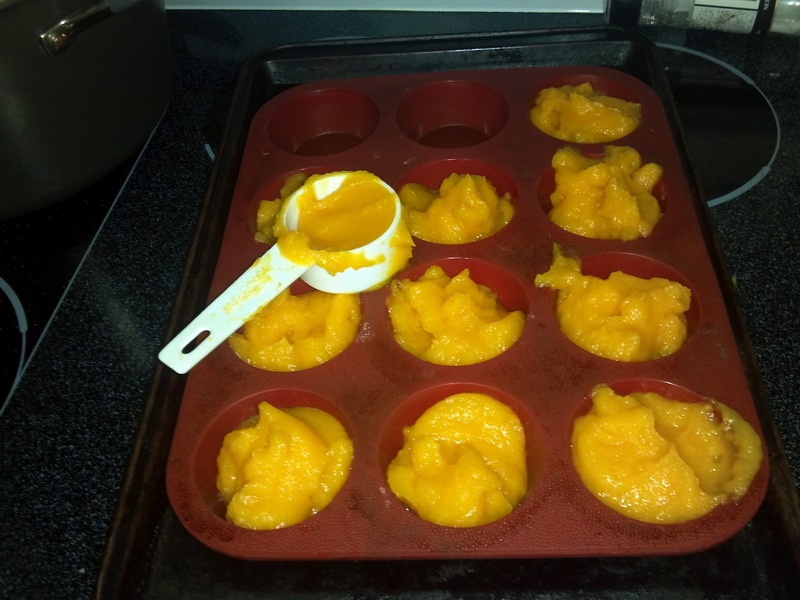 Now, the next time a recipe calls for pumpkin, I can just pop out what I need and thaw them quick in the microwave. I've found that there's a little more moisture than what's in canned pumpkin. Some of it comes out when I microwave. I just use my judgement when I'm making something on whether I drain that off or add it in. You could probably cook it down more after you've pureed it a bit to get some of the extra moisture out. Now is the time to get your pumpkin and squash. In the pictures, I used butternut squash. I got a huge one for $1. I'm getting more out of it than the boxes I'd buy at the store for more than that. And I can use it in place of pumpkin in recipes too. You could shred zucchini and freeze it this way also! What do you like to freeze? Any recipe recommendations for pureed squash? 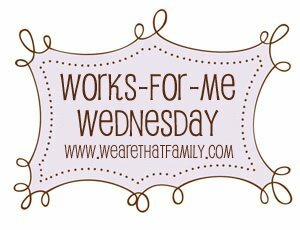 For more tips go check out We Are that Family's Works for Me Wednesday post. 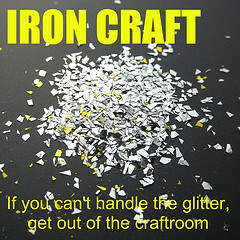 With the Olympics under way, the theme for the Iron Craft Challenge is London. When I think of London, I think of Big Ben, West Minster Abby, the Queen and scones. So for this challenge, I decided to make a crown. Originally I was going to make it from wire, but the silver colored wire I have is too difficult to crochet with, so I reverted to crochet thread. RD2: Ch5 skip 3 stitches and sc in the 4th stitch of the previous round. 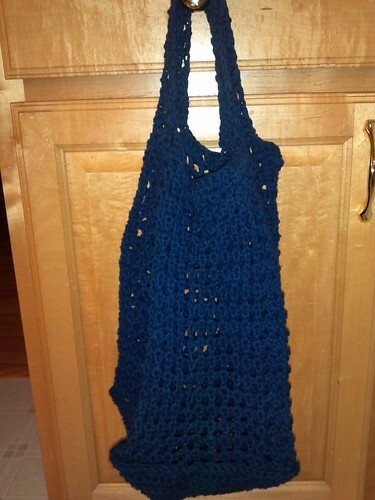 Repeat around until there are 4 stitches left in the first round, ch3 dc in the same stitch as the first chain. RD3: ch 5, sc in the middle of the next ch 5 loop, repeat around (end with a slip stich at the base of the first ch 5 of the round). RD4: sc3, picot, sc3 in the first loop, ch 6, picot, ch6 and slip stitch in the sc between the two loops of the previous row), repeat around, join, fasten off. Weave in ends then block and stiffen. to block mine, I rolled a newspaper up (so it was the same diameter as the inside of the crown), covered it with plastic wrap and then slipped the crown on the outside. I then took some straight pins and pinned it in the correct shape all the way around. After that I brushed on some white Elmers glue and left it dry. This week's Iron Craft challenge was another recycling challenge, where we were to use something that was going to be thrown out. 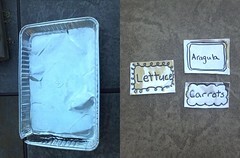 I decided to reuse an aluminum pan that came with some IKEA cinnamon rolls to make some garden tags, so I don't need to remember where I planted what. I cut the pan (using old scissors) into rectangles. Then, I carefully folded over the sharp edges. After that, I sat them on a styrofoam tray while I wrote (pressing hard) on them with a dull pencil. Finally, I went back and used a black Sharpie to write again so it would stand out a little more. For the second Iron Craft challenge this year we were to do something with hearts. 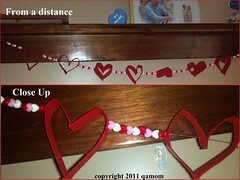 My daughters and I made this heart garland. We took a piece of the stiff glittery felt and cut them in half (so they were approximately 8.5x5.5) and then each half I cut into strips (about one inch wide). Then, my daughters sewed (they're working on learning basic hand sewing, you could use hot glue or even staples if you wanted) the narrow end of two strips with the right sides together (this becomes the top center of the heart). Then, we sewed the other two ends wrong sides together. The felt needed a little shaping still after doing that, don't worry about it for now. We did that with all of the felt. I got out some pink, white and red heart shaped beads and some fishing line. One girl worked on one end of the line and the other worked on the opposite end. They strung some beads and then using a needle threaded with the fishing line would add a heart. We went through both sides of the heart as well as the inner point of it, it's better if it's a bit closer to the top, I think, so it's less likely to flip upside down. Then more beads and more hearts until we were done with the hearts. On the ends of the fishing line, I threaded one more bead and made a loop around that bead (so the bead is trapped in the loop) to keep everything from sliding off the end and to give me something to hang it with. After doing that and hanging it, I noticed the beads had a tendency to slide and squish the hearts, so I got out my glue gun and put a little dot of glue on the heart where the fishing line went through to keep it in place. This also helped a bit with the tendency to flip. Start in the middle and work your way out to both ends. 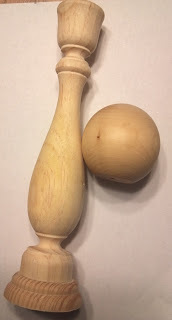 They still flip some, so I'm going to add some weights to the bottom (one I glued a bead in and that worked pretty well, but you can see it, so I'm going to try to get some fishing weights and hide them a bit more). Overall the girls did it in a few hours and had a lot of fun doing it.